Jill Stuart will release limited-edition Night Jewel Solid Perfume on July 2nd in Japan. Night Solid Jewel features the floral scent of Night Jewel Eau de Toilette that was launched in winter 2009. 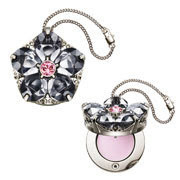 It is housed in a floral-shaped compact with a pink Swarovski crystal in the center of the top lid. The compact case also comes with a chain.